The Vosges are a low range mountains in the Eastern of France close with the border of Germany. Some lovely towns cluster around this area like Colmar and Mulhouse. Those colorful towns we also visited on a day tour, but what we came for were the mountains. We choose to sleep in a village in the middle of the national reserve of the Vosges and spend a day climbing. Or in our case; Doing a via ferrata tour. 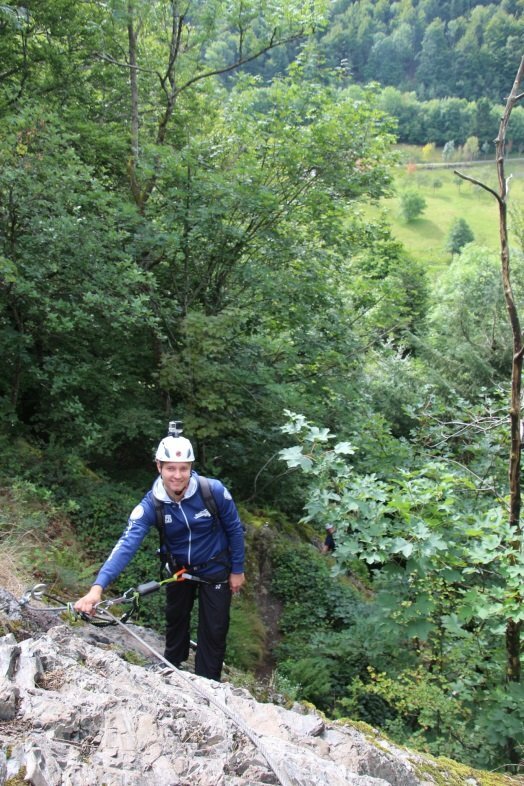 My husband Timo and i really started loving doing via ferrata which is one form of mountaineering. 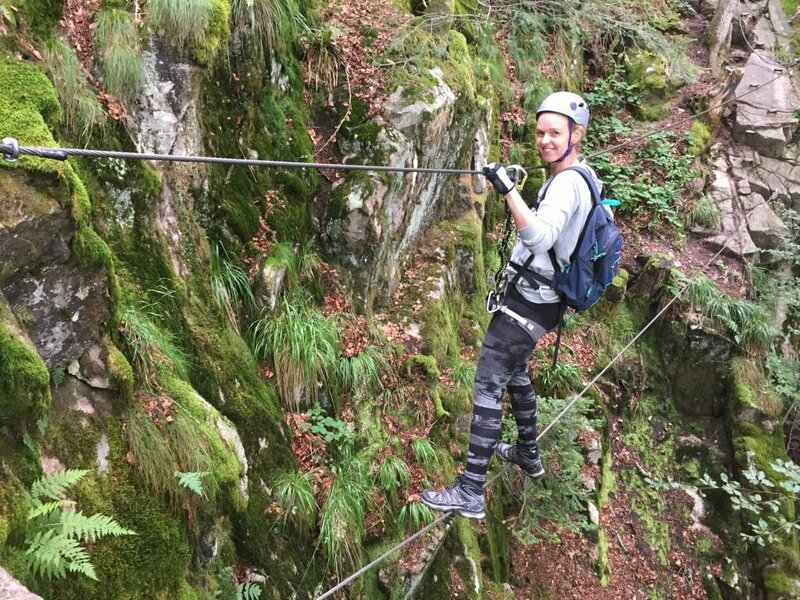 We have our own via ferrata gear, which you will need for this route. 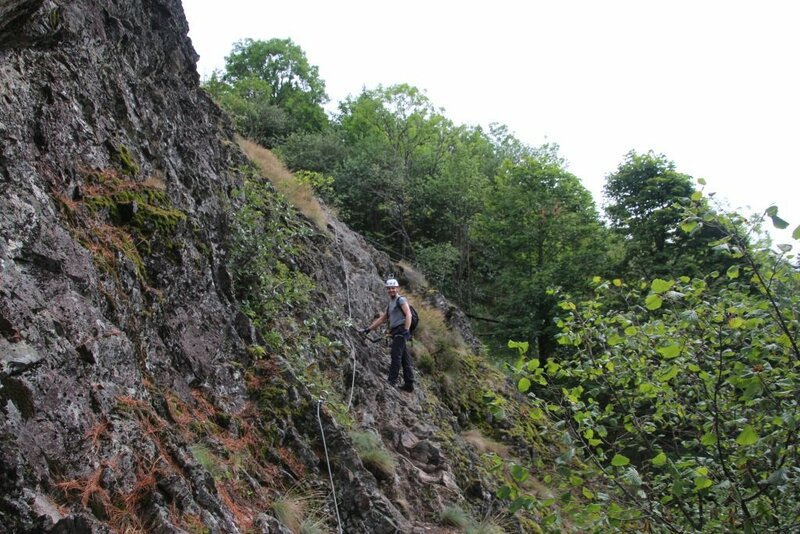 Unfortunately in this low range mountains there is only one via ferrata. It is close to the town of Bussang. The parking lot for the via ferrata Bussang is just outside the village and easy to find. 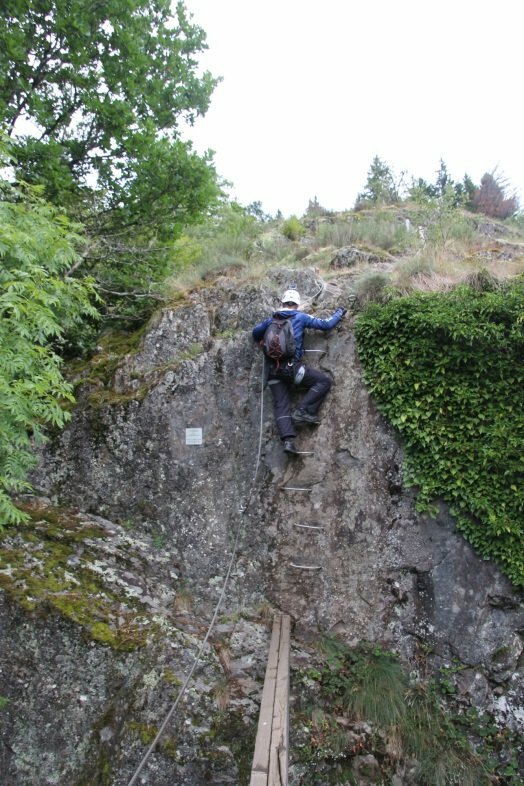 The sign will say Rando ferrata de la Source de la Moselle. The route starts with a short walk uphill trough the forest, for about 20 minutes. The route is only a medium difficult (B/C) so it would also be accessible for children with a minimum length of 140 cm. This route remains in the middle of the forest and has a few iron rungs and it is always secured with a thick metal wire. 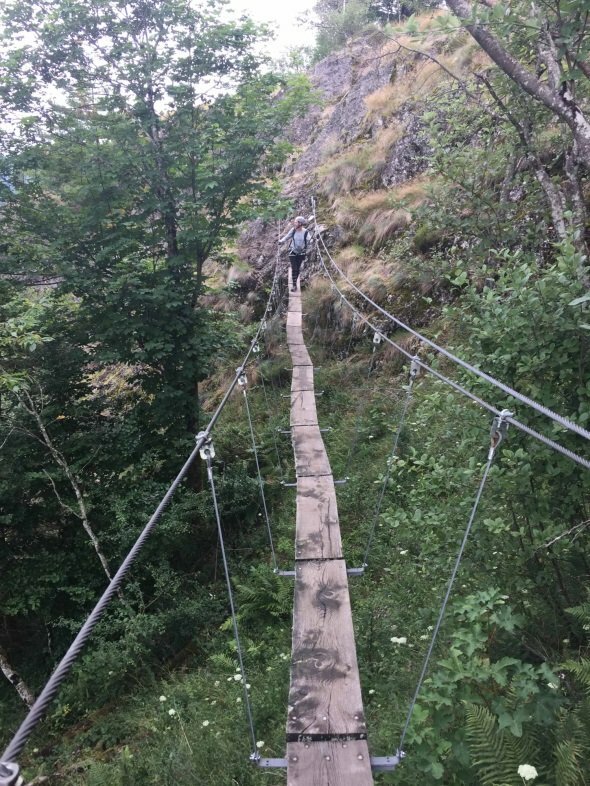 The whole via ferrata has some fun elements like a balance beam and a monkey bridge. This last one can be a little scary as it is only a thick metal wire to walk on and to keep your balance you can hold another metal wire above your head. Sometimes the rocks where cover in moss, which can make it slippery after the rain. But I think this route was very green. After you finish the first route, you can go follow the path down to the parking lot. 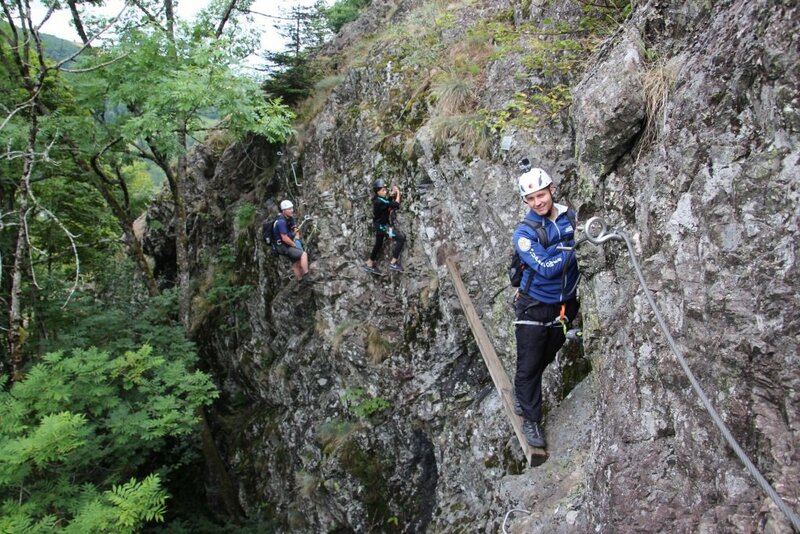 Another alternative is to continue to the next via ferrata route which is a bit harder. There was another bridge and it was just a slightly more difficult. The view from the top was really scenic, so worth the effort. Walking back to the parking lot is trough the forest again and took us about half an hour. 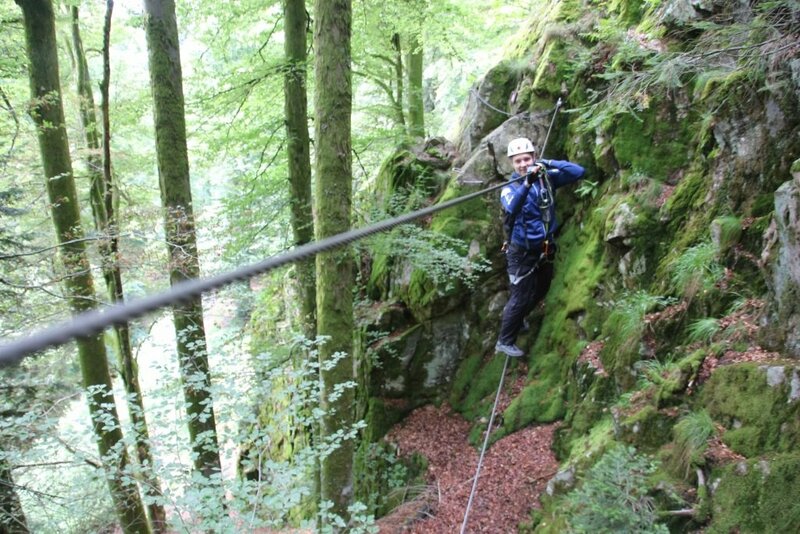 I really loved this via ferrata as it was in the middle of a forest. It had some fun (sometimes scary) elements and it would be nice to do this with a family. At the top there was a scenic view over the valley. For people who have more experience in via ferrata this one might be to easy.